How do you feel about conversations that involve disagreements, difference of opinion and conflict? If you’re like the vast majority of leaders surveyed in research on communication and conflict, you would prefer not to engage in those conversations! Most of us – and that includes me – are uncomfortable with such conversations. Enhancing comfort and competence in having such conversations is a very regular theme in my coaching work with leaders. And when workshop participants are asked what they would most like to get better at in terms of enhancing their Conversation Intelligence™, enhanced skills at handling conversations in the midst of conflict and disagreements almost always top the list. 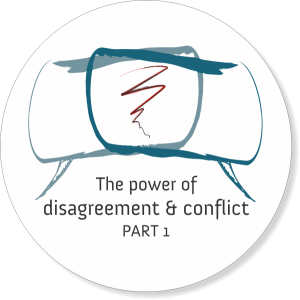 Part of the challenge with the notion of handling disagreement and conflict in our conversations and interactions, is that we lump a lot of very different things into the same box. Some conflicts involve interpersonal issues: when I feel you insulted me, or I am upset that you kept me in the dark about something, or that you did not really listen to me. Others are about tasks and processes: how we should approach a challenge, what the sensible timeline is for a project. Some involve disagreement that stem from perceived differences in values; others about things as practical as the timeline for a project. The skills required to address these various kinds of conflicts overlap a great deal – the basics of being self-aware and able to manage our own emotions, the ability to listen to really understand our conversation partner’s position, our ability to put forward our own point of view, etc. In the next few posts I look at a few mindset shifts that will help us in having constructive conversations around disagreements and conflicts in the area of ideas – whether to do things, to make sense of things, etc. Next post: Discomfort with disagreement is not a character flaw!